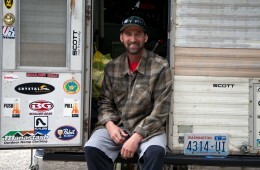 Dewitt Morris the owner of the Big Sandy Lodge approached me a few moths ago about skiing in the Southern Wind Rivers. His lodge sits right at the base of the Southern Wind River Mountains at the Big Sandy Trailhead. 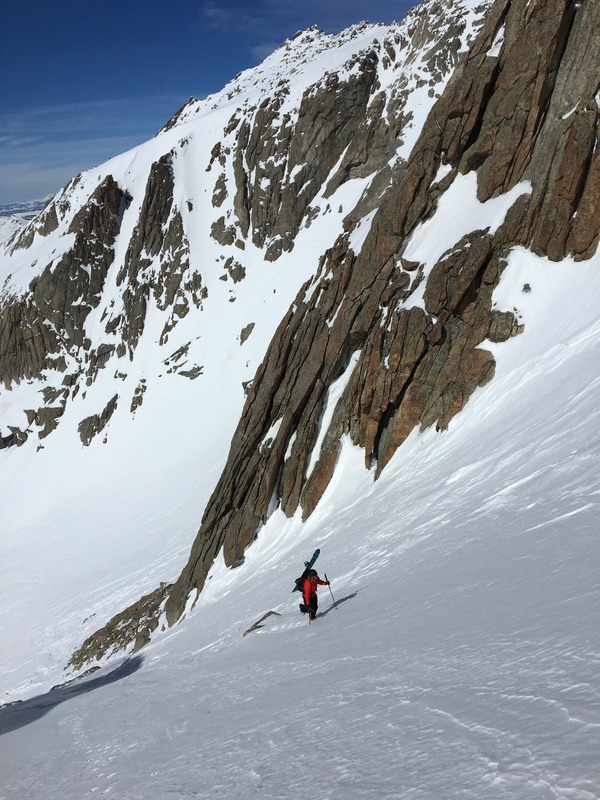 I have skied a few springs in the Winds and usually you can not get into those areas without a bit of suffering and long approaches. It is very difficult to ski in the Winds until May or June because the roads to access the trailhead are usually not free of snow until May or June depending on the year. 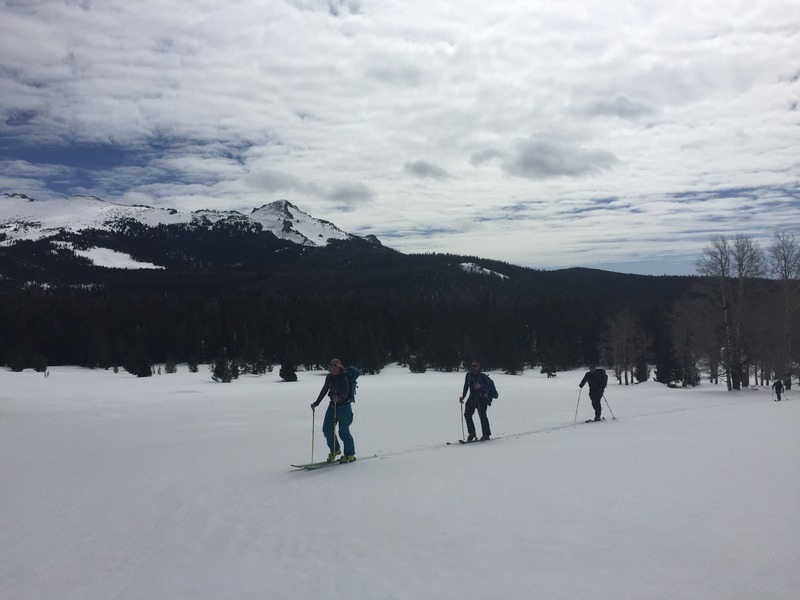 I was psyched when D invited me and a crew of friends to snowmobile into the lodge, stay there and check out skiing from the lodge via snowmobile to Wilderness boundary and then skinning the rest of the way. 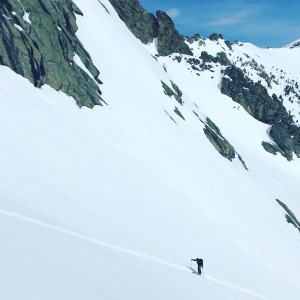 D is interested in doing a few guided ski trips into the Winds a year and we went on recon to see if it would be a possibility. We met D early Friday morning, loaded up the sleds and started our adventure. 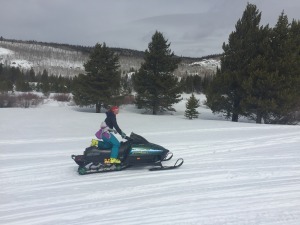 I have never driven a snowmobile before so this was a new thing for me. It was pretty entertaining and lot harder then I thought, I named my sled green goblin and we bounded from the beginning. The sled only threw me off a few times when I gave it to much throttle. Learning how to drive the Green Goblin! After a few sled malfunctions we arrived at the lodge just under 2 hours, this was so amazing to be this close to Winds in March. The Winds to me are such a special place to ski because I grew up spending my summers in these mountains since I was 5 years old. Being out here all alone with no other skiers or people is a pretty surreal experience in such big mountains. We dropped our stuff and headed to ski a peak I have skied a few times called Peak 11930 this peak sits right next to Independent Peak and Temple peak. We were able to take the sleds to the Wilderness Boundary through Sedgewick Meadows. This was about a 20 min sled approach from the lodge. We then skinned from the sleds toward the peak. In just about 2 hours we were on top of the peak just in time for some good afternoon spring snow. 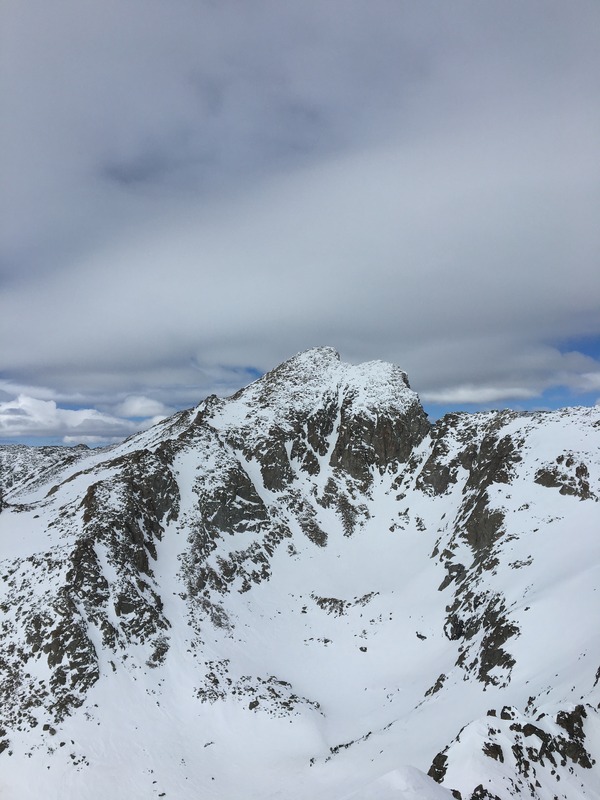 We were able to get great views of other ski lines around us one being Temple peak which is one of my favorite mountains which I have skied from both sides but never skied from the summit. 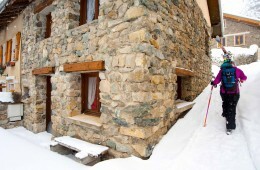 We were back at the lodge in about 4 1/2 hours from when we left to ski. The lodge is very rustic and has 2 fire places and sits protected in the trees on Mud Lake. It made for a great cozy place to crash for a few nights. It was a nice change not having to sleep in a tent and cook outside. 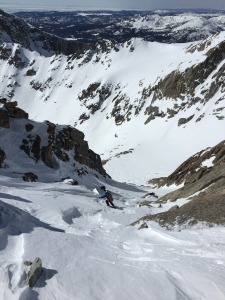 Travers booting up our unnamed couloir on Temple. Starting the boot up Temple Peak! The next day we made our way back to Sedgewick meadow with the goal of skiing Temple Peak, this day was going to be a bit longer but what was nice is we had lots of daylight. The temps were cool enough to not have to worry about the snow warming to quickly which is usually the case in May or June. Coming into the Temple Peak basin gave way to lots of different options of couloirs and fun open faces. Temple looked a bit wind scoured but looked manageable. Myself, Travers and Redbeard headed up an unknown couloir on the northwest side of Temple. 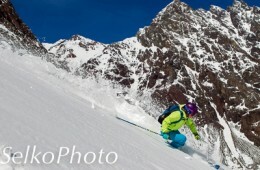 I had skied the couloir next to this one a few years back but it did not look very filled in this year. 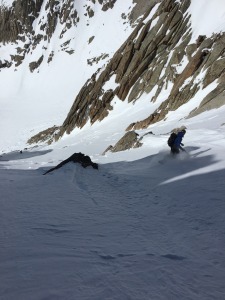 We started up the couloir and then reached the summit ridge and summit in a few hours. Temple sits just under 13,000 feet and from the summit it drops strait down a few thousand fee to the valley floor. The views are amazing looking into deep lake area and the Cirque of the towers. You could see so many more fun ski lines from this vantage point. 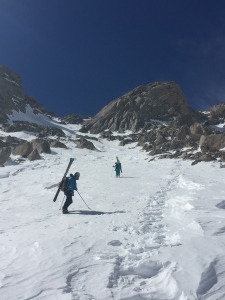 We had some pretty good corn skiing off the summit and then some chalky wind blown snow through the couloir. Overall a really great ski. 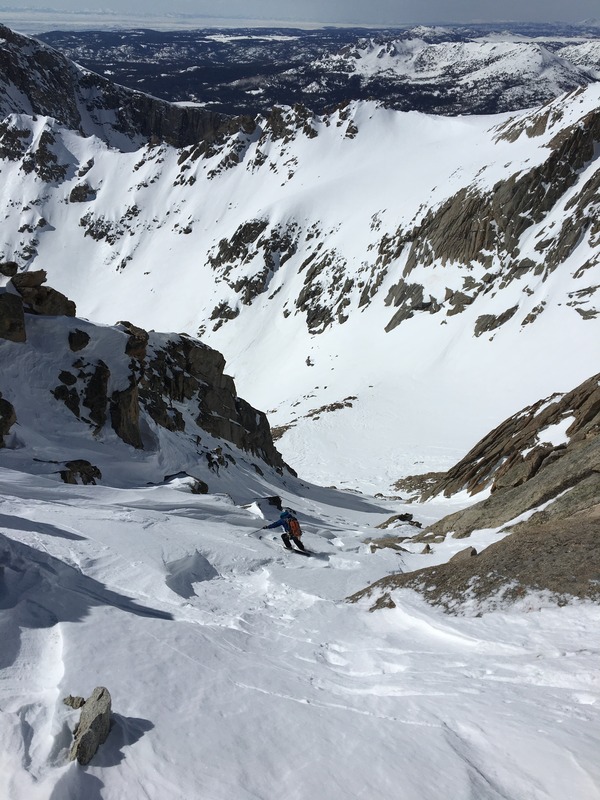 We watched Brian and Nate ski a fun face into a couloir across the way. The looked like little ants dropping in to a big valley. We all met up in the basin hooting an hollering and stoked with our day. D found himself some great corn off the backside of Peak 11930. A very successful day there was something for everyone. We made our way back to the sleds and back to eat some great elk steaks and watch the sunset over the mountains. Not a bad way to end the day after skiing 4,000 ft! Redbeard skiing down Temple, amazing views! Final Day Laturio Peak! Nate coming up the pitch! Travers making it look fun!